FILE PHOTO: Visitors take pictures of a model of Boeing's 787 Dreamliner during Japan Aerospace 2016 air show in Tokyo, Japan, October 12, 2016. SINGAPORE - Boeing has signed a memorandum of understanding to sell 16 aircraft to Malaysia Airlines, eight widebody 787 Dreamliners and eight narrowbody 737 MAXs, the company said on Wednesday. 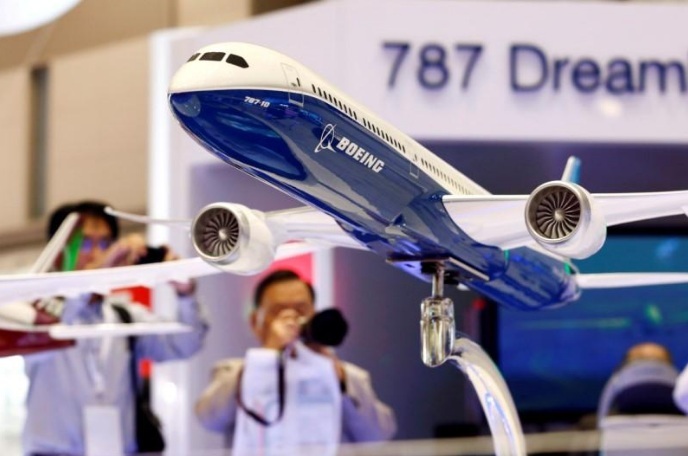 The eight 787-9s were converted from a prior 737 MAX order while Malaysia Airlines also added eight purchase rights over 737 MAX aircraft, Boeing said. Malaysian Prime Minister Najib Razak announced the plan to buy additional planes for the country’s flag carrier during a visit to the White House on Tuesday, telling U.S. President Donald Trump that Malaysia Airlines would buy 25 Boeing 737 jets and eight 787 Dreamliners. He said the airline would probably add another 25 737s in the near future, a deal he said would be worth more than $10 billion within five years. Boeing declined to comment on Najib’s numbers. Malaysia Airlines in 2016 signed a deal to buy up to 50 737 MAX aircraft, which included 25 firm orders and 25 purchase rights. Malaysia Airlines Chief Executive Peter Bellew said in a statement that the range of the 787-9 would allow the carrier to operate to any point in Europe and some destinations in the United States. At present, the airline has an all Airbus SE widebody fleet. Two industry sources on Tuesday told Reuters that Malaysia Airlines had considered buying Airbus A330neos before settling on the 787 order. The sources did not want to be named because the discussions were private. Boeing has signed a memorandum of understanding to sell 16 aircraft to Malaysia Airlines, eight widebody 787 Dreamliners and eight narrowbody 737 MAXs, the company said on Wednesday.